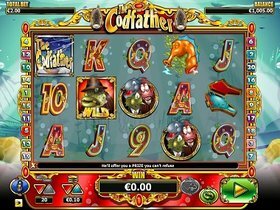 The gangster theme has been maintained with the under -water world being the underworld with the fish characters all made to look like mobsters .The game is presented with 5 reels and 20 pay lines with coin sizes ranging from 0.01 to 2.00 accepted. To start playing you need to determine your bet using the up / down arrows to select the number of lines. Once you have done that you then use another set of arrows to determine the value of your wager. Once you have completed the set up you hit the Play button. There is a Wild as well as a Scatter symbol and the game features Free Games, a Big Boss Bonus as well as a Gamble feature. The Codfather is the Wild symbol and he will only appear on reels 2, 3 and 4 but ne will substitute all other symbols except the Scatter Your winning potential is increased when you trigger him and a wining line with the Codfather in it will double your money. Trigger at least 3 Scatter symbols entitles you to the Free Games feature. You are immediately allocated 10 Free Spins. Winning on a Free Spin will triple your prize. The gamble feature can be quite rewarding (but remember it is a gamble) On a winninbg line you play the Hearts & Clubs button. If you guess the right colour of the card your winnings are doubled and x4 should you also get the suit correct. The Codfather is a clever play on the movie with good and amusing graphics and most important some good money to be won!